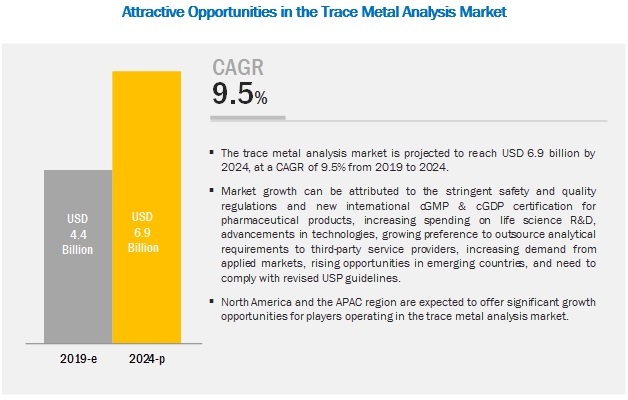 [168 Pages Report] The global trace metal analysis market is projected to reach USD 6.9 billion by 2024 from USD 4.4 billion in 2019, at a CAGR of 9.5%. The growth of this market is mainly driven by the stringent safety and quality regulations and new international cGMP & cGDP certification for pharmaceutical excipients, increasing spending on life science R&D, advancements in technologies, growing preference to outsource analytical requirements to third-party service providers, increasing demand from applied markets, rising opportunities in emerging countries, and the need to comply with revised USP guidelines. On the basis of technology, the ICP-MS segment is expected to account for the largest share of the services market in 2019. The large share of the market is mainly due to factors such as the increasing demand for the analysis of a diverse range of sample matrices; growing focus on the identification of low-level contaminants in chemical products; increased stringency of quality assessment and testing in the beverages, foods, cosmetics, and pharmaceutical industries; and the growing demand for metal speciation. Based on application, the environmental testing segment is expected to account for the largest share of the market in 2019. The large share of this segment can mainly be attributed to increasing R&D investments by major industry players; an increasing number of regulatory actions for controlling environmental and water pollutants, reducing emissions, and minimizing human and environmental exposure to toxic chemicals and wastewater; and the growth of end-user application industries. The trace metal analysis market in APAC is expected to grow at the highest CAGR during the forecast period. This is due to the growing use of trace metal analysis in the food industry, strategic expansion by market players in the Asia Pacific region, emerging biotech industry, increasing focus on soil testing, and the growing food safety and environmental safety concerns in several Asia Pacific countries. The increasing R&D funding, a growing number of CROs, and favorable government initiatives to promote the growth of pharmaceutical and biotechnology industries are some of the other major factors driving the growth of the Asia Pacific market. Prominent players in the global trace metal analysis market are Agilent Technologies (US), Thermo Fisher Scientific (US), PerkinElmer, Inc. (US), Analytik Jena AG (Germany), Bruker Corporation (US), Hitachi Hi-Technologies Corporation (Japan), Rigaku Corporation (Japan), Shimadzu Corporation (Japan), Eurofins Scientific (Luxembourg), Intertek Group PLC (US), SGS S.A. (Switzerland), Bureau Veritas S.A. (France), TÜV SÜD (Germany), and LGC Ltd. (UK). Agilent is the leading provider of trace metal analysis solutions across the globe. The company offers an extensive product portfolio of products and software for all the trace metal analysis technologies such as ICP-MS, ICP-OES, and AAS. The company focuses on developing technologies that enable in detecting trace metal from various samples for various industries in order to serve the customer base. To improve patient experience, Agilent Technologies focuses on organic strategies such as product launches and enhancements. Investing in R&D enables Agilent to expand its product portfolio by launching new and advanced products. The company launched ICP-MS Water Analyzer8900 Triple Quadrupole ICP-MS, and 5110 ICP-OES, in 2018 and 2016 respectively. The company also uses a multi-channel approach, including direct sales, electronic commerce, resellers, manufacturers' representatives, and distributors to market its products to its end users. This provides application-focused solutions that include instruments and software for studying metal samples at the molecular level in clinical and life sciences research and other applied areas. Thermo Fisher Scientific is a leading provider of superior quality analytical instruments, software, and services for trace metal analysis. The company continuously increases its depth of capabilities in technologies, software & services, and leverages its extensive global channels to address its customers’ emerging needs. The company focuses on R&D to maintain its leading position in this market. Also, in the past three years, Thermo Fisher Scientific launched and enhanced 15 products with innovative technologies. Geographically, Thermo Fisher Scientific has a strong presence in North America, Europe, and the Asia Pacific. Its strong distribution channels help it to cater to the rising demand for trace metal analysis instruments across the globe. However, increasingly stringent government regulations and global financial fluctuations are major threats to the company’s revenue generation. In 2018, Eurofins Scientific acquired TestAmerica Laboratories, Inc. (US). This acquisition strengthened & expanded its environmental testing business in the US for services such as wet chemistry, trace organics & specialty testing, and metals & inorganics testing in the trace metal analysis market. In 2018, Agilent Technologies collaborated with Nanyang Environment and Water Research Institute (NEWRI), (Singapore) to address persistent and emerging contaminants in water. In 2018, SGS opened a new laboratory in India to enhance elemental impurity testing services in the APAC region. Who are the major industries of trace metal analysis instruments? Which are the major trace metal analysis services? Which technologies are mainly used for trace metal analysis? 11.2.2.1 Establishment of Quality and Safety Regulations and Its Compliance is Expected to Drive the Growth of Trace Metal Analysis Market in Canada. Secondary research process involves the widespread use of secondary sources, directories, databases (such as Bloomberg Businessweek, Factiva, and D&B Hoovers), white papers, annual reports, company house documents, investor presentations, and SEC filings of companies. Secondary research was used to identify and collect information useful for the extensive, technical, market-oriented, and commercial study of the trace metal analysis market. It was also used to obtain important information about the key players and market classification & segmentation according to industry trends to the bottom-most level, and key developments related to market and technology perspectives. A database of the key industry leaders was also prepared using secondary research. In the primary research process, industry experts from both the supply and demand sides were interviewed to obtain qualitative and quantitative information for this report. Industry experts from the supply side include suppliers, distributors, CEOs, vice presidents, marketing and sales directors, business development managers, and technology and innovation directors of trace metal analysis instrument & service providers, whereas, industry experts from the demand side include industry experts such as vice presidents & directors of manufacturing companies from various industries such as pharmaceutical & biotechnology, medical device, semiconductor, oil & gas, and environmental testing; directors of clinical laboratories; contract manufacturing organizations; trace metal analysis technicians, outsourcing service providers and application experts; and other related key opinion leaders. The market size estimates and forecasts provided in this study are derived through a mix of the bottom-up approach (revenue share analysis of leading players) and top-down approach (assessment of utilization/adoption/penetration trends, by technology, instrument type, and application). After arriving at the market size, the total market was divided into several segments and subsegments. Data triangulation and market breakdown procedures were employed, wherever applicable to complete the overall market engineering process and arrive at the exact statistics for all segments & subsegments. Thermo Fisher Scientific (US), Agilent Technologies (US), PerkinElmer, Inc. (US), Analytik Jena AG (Germany), Bruker Corporation (US), Hitachi Hi-Technologies Corporation (Japan), Rigaku Corporation (Japan), Shimadzu Corporation (Japan), Eurofins Scientific (Luxembourg), Intertek Group PLC (US), SGS S.A. (Switzerland), Bureau Veritas S.A. (France), TÜV SÜD (Germany), and LGC Ltd. (UK). A further breakdown of the Rest of Latin American trace metal analysis market into Argentina, Chile, Peru, and Colombia and others.